10% for senior citizens (65 years or older or NZ Super-gold Card holders), full time tertiary students with current ID, YHA and BBH members with current ID. 50% for children up to and including 13 years old when accompanied with a full fare paying adult. West Coast Regional Council 'Total Mobility Vouchers' are accepted with one voucher to be used for each direction. Each voucher has a maximum value of $15.00 off the applicable fare. prior to travel. No seat is confirmed until payment is received. meet this notice period will incur a penalty fee of 50%. more than 24 hours’ notice will incur a 10% penalty fee. 24 hours of the travel date will incur a 50% penalty fee. paid minus any penalties listed above. return fare is non-transferable and non-refundable, and must be booked 24 hours in advance. All other full fares may be altered subject to the above conditions. Children are considered to be aged 13 years and under. A childs fare is 50% of the full fare only when accompanied by a non-discounted adult fare. With the exception of the unaccompanied children's' fare, children must be accompanied for the full journey by a responsible person aged 16 years and above. apply to all journeys to or from Christchurch International Airport. The Sudima Hotel is exempt from this charge. 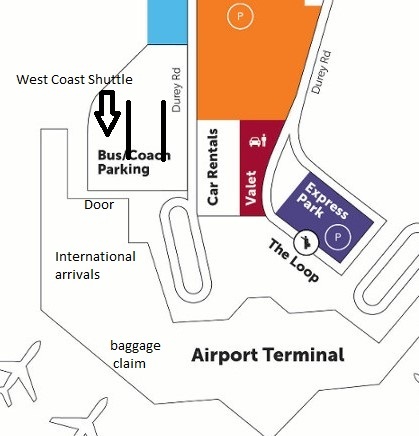 International Airport bus stop is signposted as “Regional and Intercity Shuttles”. for any damages due to delay. unforeseen delay, particularly in the winter months. West Coast Shuttle will take all reasonable care whilst handling luggage however will not be held liable for any damage that occurs throughout the journey. Passengers are encouraged to keep fragile items within their care. Items left on the bus will be held for a period of one month at the Greymouth office. After this period, they will be either disposed or donated to charity.